I've often pondered that photo. I was thinking combined exposures. Is it too early for some scotch, neat?
" 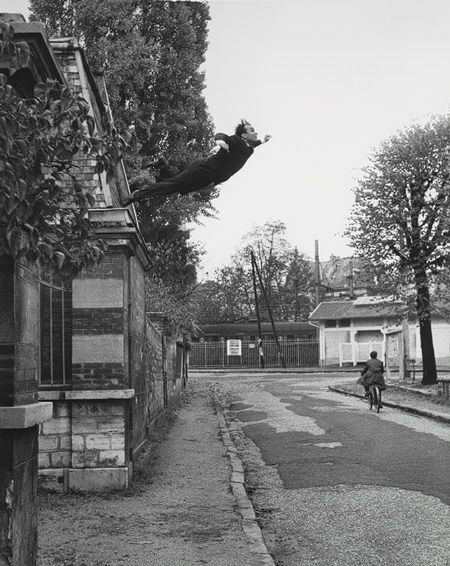 In October 1960, Klein hired the photographers Harry Shunk and Jean Kender to make a series of pictures re-creating a jump from a second-floor window that the artist claimed to have executed earlier in the year. This second leap was made from a rooftop in the Paris suburb of Fontenay-aux-Roses. On the street below, a group of the artist’s friends held a tarpaulin to catch him as he fell. Two negatives--one showing Klein leaping, the other the surrounding scene (without the tarp)--were then printed together to create a seamless "documentary" photograph." Hi, Meghan! I probably last visited Fenway in the late 1970s. Ah, that makes me feel better Jeff! I thought I was a bad fan for not having gone in such a long time!! We should have a WFMU field trip! I've never seen the Pawsox or the Spinners, despite them being only 2 towns away from my hometown.... Which was in the news recently for the crazy gas line blowing up houses! Yeah that was a crazy story. One of my closest friends (from college) is from North Andover. Had to check in re his family after that...yours ok? Yeah. My mom is now in Methuen, which wasn't affected. My inlaws are in Andover and they are fine and was actually driving up to Montreal the day it happened. But they haven't had gas since it happened. Which makes some things in everyday life a bit difficult. Their oven is electric, but heating.... showers.... ugh. Our McDonald's blew up. That is kind of the only good thing that happened! A good man, Stanley. Showed me some of his old haunts in London, when I was there this past Spring. Sem! I love being able to show people what they may miss if they rely on a guide book to get around. Love it when others do the same for me, too. I've got Barcelona in my sights for the Christmas break. I think my next trip will be to Vietnam.... a trip with my brother to a place we both have been itching to visit in memory of my dad, who I don't think ever got to go there.... Try to hit some places he hasn't been to finish his travel journeys! As a Gaudi fanboy, I did not stray very far from his work, but had some of the best meals i'd ever had in Spain on local places on streets parallel to Las Ramblas. Work had kept me away...... chiming before the end! Very good idea, Meghan. I would love to do the The Reunification Express between Ho Chi Minh City and Hanoi, one of the most spectacular railway journeys in the world. They say the food in Hue ... is very good. But tropical climes melt my brain. Sem - Art, beer, food that's what I'd be after (and shopping for Viccy). Life is about tasty food, a good drink and amazing sites..... soak it all up! Hue is an ancient capital and still has some ancient architecture still standing (rare for Vietnam). And it gets damn hot in WI, too. That's when I head north. Back in the wayward day, I'd go for the barbequed grasshopper without hesitation. but nowadays, I'm not so sure. I have cipollinas at home, to make cricket tacos! Hot, in WI, pfft. It's still in the 90sF w/ 90% relative humidity. Although I thought I knew heat, until I got off the plane in Bangkok, that hit me off the tarmac, like a punch in the face! Lovely to see you back, Meghan. All the very best. Til next week.